Sakthi Electrical Control (Brand name Sakthi) is iso 9001:2008 certified company own by Mr S Thilagar (Electronics & Communication engineer) established in 2001.We manufacture Automatic/Servo Controlled Voltage Stabilizers, Isolation Transformers (Range 1KVA to 3000 KVA) as per BIS (Bureau Of Indian Standards) specification IS:9815 Part 1 and certified by DGS& D. We have a PAN India presence & and we are always ready to serve clients who are Quality Conscious. We are known in the industry for our quick response and after sales service network. We are one of the largest supplier to the Defense Projects in India. •	We are available on Rate Contract with Directorate General of Supplies & Disposals (DGS& D) RC Contract No. SMC/ME-5/RC-B3090000/0416/05/OA245/587 Valid from 06-AUG-15 To 31-JUL-16 for Servo Voltage Stabilizers. •	We are approved by Engineer In Chief Branch (MES) (ENC)Army HQ vide their letter no.43285/119R/2003/04/Des2 dated 14 November 2006. •	We have established a quality management system that is in compliance with the international quality system standard ISO 9001-2008. •	We are also the part of the Dun & Bradstreet Global Database and has been assigned the D& B D-U-N-S NO. 91-670-4173. Our Vision:- “Once a customer always a friend” •	We believe in Ethics & Commitment to high quality standards. •	We want to underline that whatever we commit about quality, we always deliver the same. Company Record: Our manufacturing unit is in approved industrial area, having •	MCD (Municipal Corporation of Coimbatore) •	DPCC (Delhi Pollution Control Certificate) •	S.S.I. (Small Scale Industries Registration ) •	VAT (Value Added Tax) •	ESI (Employees' State Insurance) •	Trademark & Excise registrations. Testing facility : Tested as per BIS 9815:Part1 parameters with testing meters duly calibrated by NABL(National Accreditation Board for Testing and Calibration Laboratories approved Labs & time to time third party inspections from CEIL (Certification Engineers International Ltd.), MES (Military Engineer Services), DGSND (Director General Of Supplies & Disposals ) keeps our standards high. Further acceptance test are conducted on every unit and test report issued as- •	Physical Examination (Clause No. 6 & 10) •	Insulation Resistance Test (Clause No. 11.4) •	High Voltage Test (Clause No. 11.5) •	Provision For Earthing (Clause No. 7.2) •	Leakage Current Test (Clause No. 7.3) •	Output Voltage Test (Clause No. 11.6) •	No Load Current Test (Clause No. 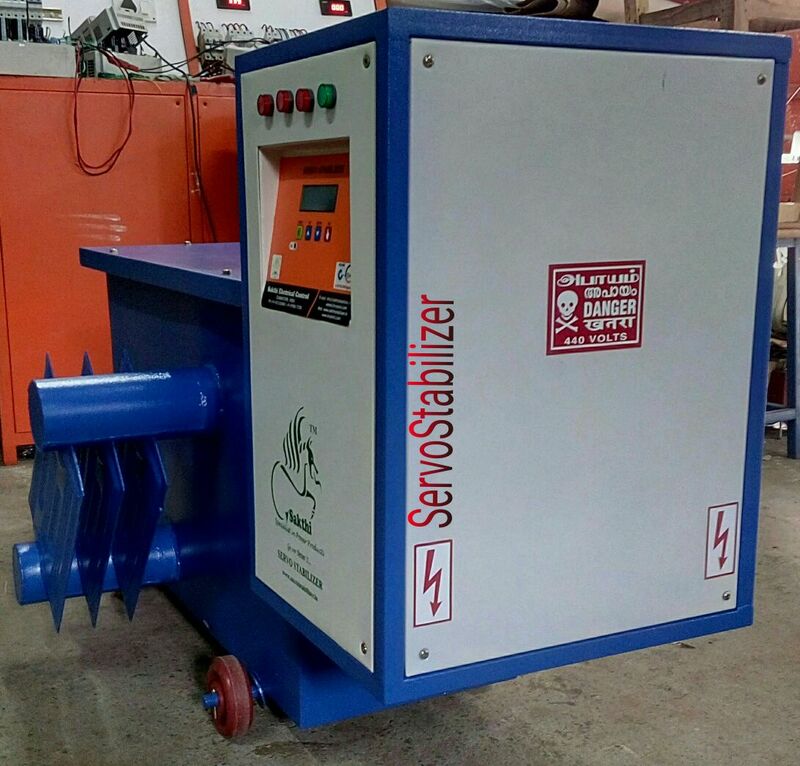 11.7 & 9.5) •	Measurement Of No Load Losses (Clause No.11.8 ) •	Measurement Of No Load Losses & Efficiency (Clause 11.9 & 9.6) •	Induced Voltage Test (Clause No. 11.10) For more information: +91 9786077355 or info@sakthistabilizer.in. Why Sakthi? 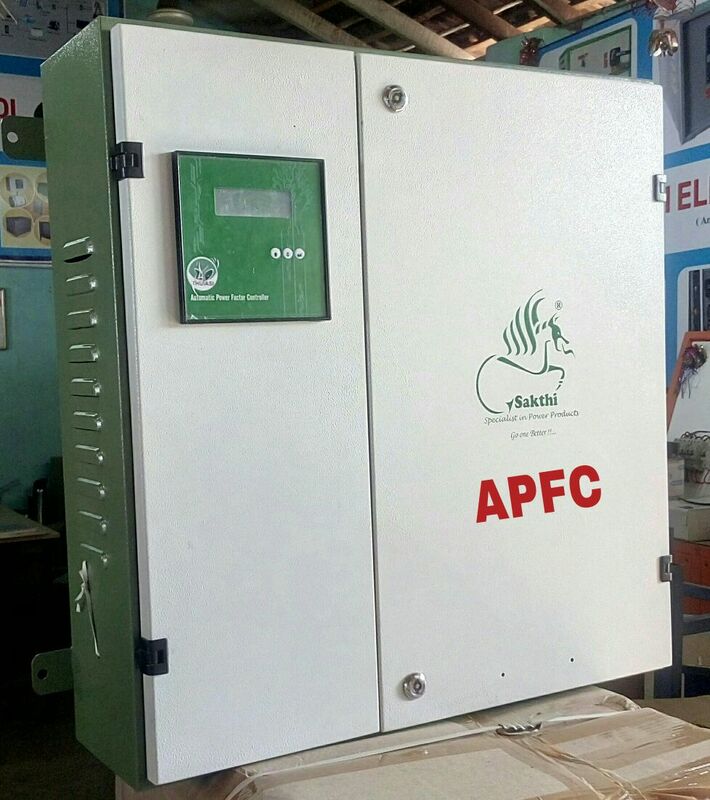 We have delivered /designed our products for extreme weather conditions of India like our products are running successfully in - •	Srinagar, Jammu & Kashmir (Extreme Cold), •	Siliguri, West Bengal (Cold and Humid), •	Barmer, Rajasthan (Extreme hot), •	Cochin, Kerala (Highly Humid), We check every control system of our stabilizers in humidity chamber to ensure that they withstand extreme weather conditions of our country. Please Note:- Copy of type test report 600 KVA Servo Oil Cooled Voltage Stabilizer issued by ETDC(Electronic Test and Development Centre), Ambala and CEIL(Certification Engineers International Ltd.; A wholly owned subsidiary of Engineer’s India Limited, A Government of India Undertaking) with our client list is attached. Prestigious Clientele : Government Sector- •	VVIP’s residence of Honorable Lok Sabha / Rajya Sabha Members •	Member of Parliament •	Honorable Air Chief Marshal •	Defense/Domestic Airports •	Central Public Works Department •	Delhi Development Authority •	Special Protection Group •	Sulab International Social Service Organization •	Delhi Jal Board •	Defense Research & Development Organization •	Indian Archaeological Department etc. Private Sector- •	Aakash Educational Services Ltd •	AFP Manufacturing Company •	Ambuja Cement Ltd. •	Arise India Ltd. •	Bikanervala Foods Private Ltd. •	Brazil Embassy •	Dhruv Global Associates •	Ekta Shakti Foundation •	Otis Elevators •	Olympus Elevators •	Rana Motors •	Shapoorji Pallonji & Co Ltd. •	University Of Kashmir •	VLCC Institute etc. Winding Material : We manufacturer stabilizer in pure electrolyte Copper Wire/Strip. •	Capacity check :Please feel free to come to our unit and do a self check or allow us to do a third party inspection complete tests as per BIS 9815:1994 Part 1 on full load . It will give you confidence in our products. •	Manufacturing capacity :In every 28 hour our products installed somewhere in India.